The 2014 edition of the Inglis Melbourne Premier yearling sale is just over a month away. 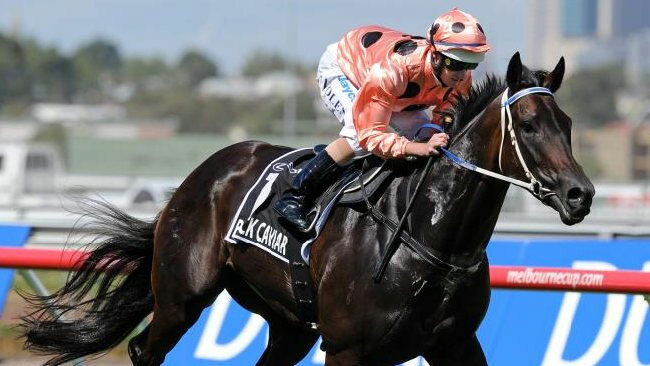 The source of world champion Black Caviar, its first lot this year will parade at 12 Noon on Sunday, March 2. Conceived, born, raised, sold, owned and trained in Victoria, Black Caviar received her most recent accolade last week when officially rated equal-top of the year-end 2013 Longines World’s Best Racehorse Rankings released by the International Federation of Horseracing Authorities (IFHA). “The total number of Australian-bred horses rated 115 or more by IFHA has increased 400% in the last ten years — underlining the tremendous growth in the Australian thoroughbred and its international reputation,” points out Inglis Melbourne Director Peter Heagney. “Racing both here in Victoria and in many other states of Australia is a tremendous passion. A total of 775 lots have been catalogued for the Melbourne Premier and 61% are Super VOBIS Qualified, just as Black Caviar was in 2008. Black Caviar was offered as Lot 520 from the draft of Swettenham Stud (as agent for Gilgai Farm). The daughter of Bel Esprit was snapped up by trainer Peter Moody for $210,000. With a median price of just $60,000, Melbourne Premier has an enviable record as the sales source of top level sprinters such as Black Caviar, Starspangledbanner, Weekend Hussler, Alinghi, Ortensia, Reward For Effort, Turffontein, Costa Viva, Rostova, Stepitup and Sacred Kingdom. Inglis Melbourne is also growing an impressive record as a source of outstanding middle distance and staying type horses such as Fawkner, Polanski, Pinker Pinker, Arapaho Miss, Hollow Bullet, Escado and Igugu. Over a ten year period the stakes winners-to-lots sold from Melbourne Premier has risen 44%. All of Australasia’s leading sires are represented in the 2014 catalogue with yearlings that were carefully selected from almost 2,000 entries received for the sale. “An improving genetic pool in Victoria and increased vendor support from other major states has enabled our bloodstock team to be increasingly selective on type and conformation for Melbourne Premier,” Heagney added. Another red-letter day for off the track thoroughbreds at the Royal Melbourne Horse Show. The Australia Day long weekend saw another feature event on the Victorian show horse calendar, the 2014 RASV Royal Melbourne Horse Show, and with it came more success to retired racehorses. 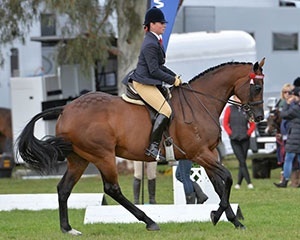 A record number of retired racehorses lined up across the four days of the event and the results, particularly on Friday where thoroughbreds were celebrated as the feature breed, reflected the continuing dominance of off the track horses in the show ring. Racing Victoria sponsored multiple thoroughbred classes on Friday with the signature Off The Track ring, only open to retired racehorses, taken out by Estambul gelding Hot Five. The seven-year-old failed to fill a placing in eight starts on the track for Canberra trainer Jules De Smet but is proving a rising talent in the show ring after only a short retraining period. “I’ve just taken over the ride on him and for a horse off the track he’s just amazing, he’s so quiet and taking it all in his stride,” rider Michelle Tuma Webb said. Fairytale mare Pink I Am followed up her breakthrough success at the VAS Saddle Horse Championships earlier this month with a win in her thoroughbred mare class for teenage rider Abby Heffer. Another mare, 12-year-old High Fashion, took out Champion Ridden Thoroughbred for Syenna Vasilopoilos while Zabeel gelding Ramsay Park Kaarma, a $260,000 Macedon Lodge yearling purchase, won Supreme Champion Led Thoroughbred for Katie Ramsay. And while he couldn’t claim top honours for Inverleigh rider Fiona McIntyre, dual Group 1-winning gelding Sirmione hinted at a bright future in the show ring with encouraging performances in a number of classes. McIntyre is now likely to set the former Bart Cummings-trained Australian Cup hero on a campaign that will culminate with a start in one of Australia’s most coveted show competitions, September’s Garryowen during the Royal Melbourne Show. “I was absolutely thrilled with his performance out there, there was a lot of atmosphere in the arena and he went really well,” McIntyre said. “I’m getting a lot of compliments and feedback, not only from judges, but anyone that sees him in competition and tells me how well he is looking. Gonski two year-old Duckworth earned a trip to Melbourne on the strength of an impressive victory at Morphettville on Saturday. Duckworth (2g Gonski — Always Vain by Keltrice) is unbeaten after two starts in Adelaide. He was a first-up winner in October and resumed with another on-pace victory in the Meetings & Events Australia Plate (1000m). 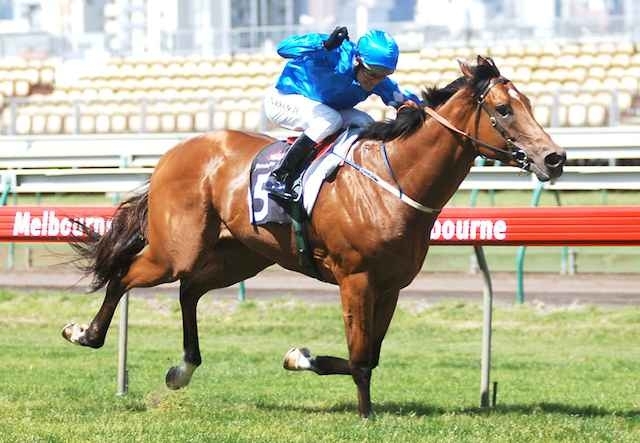 “The Blue Diamond Prelude in a fortnight is an option,” trainer Jon O’Connor said. “Miracles of Life went across last year and we might see how this one lines up against the better youngsters. Duckworth failed to make a $10,000 reserve at the 2013 Adelaide Magic Millions. His dam Always Vain is an unraced half-sister to G3 HKJC Sha Tin Vase winner Always Flying (El Moxie). Gonski (Danehill) is located at Bunyip-based Oxford Park Stud after starting his stud career at Darley. He had won a Rosehill juvenile by four lengths on debut and returned to win the LR Concept Sports Stakes at Flemington as a spring three year-old. Oxford Park studmaster Michael Howard stands Gonski for a $4,400 (inc gst) service fee. The chestnut is also a pin-up for Swettenham and Greta West Studs. Trust In A Gust (3c Keep The Faith — Subtle Breeze by Storm Cat) was bred and sold by Swettenham owner Adam Sangster for $45,000 at the 2012 Melbourne Premier yearling sale. Subtle Breeze’s yearling by Equiano made $120,000 at this month’s Gold Coast Magic Millions. The mare’s latest foal is a colt by Master Of Design. His sire Keep The Faith was initially based at Swettenham and Sangster kept a stake in the son of Sunday Silence when he relocated to Greta West. Studmaster Laurie McCarthy stood him for a $4,400 (inc gst) fee last year. 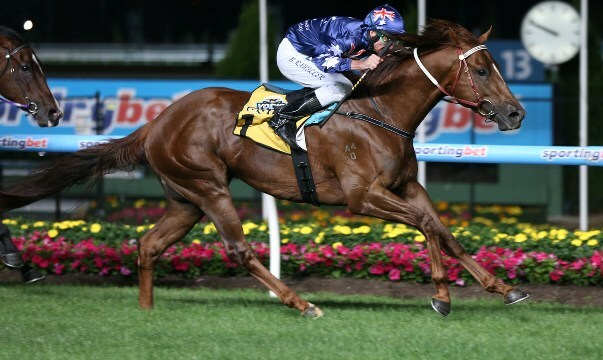 Trust In A Gust holds a Group 1 nomination for the $500,000 Australian Guineas (1600m) at Flemington on March 1.